I love me a good niche app, and Status Magic 1.7 (Mac App Store link) is an excellent one. You're in the target audience for Status Magic if you ever take—and share—iOS screenshots. So app developers and folks in my own trade should pay close attention. When you snap an iOS screenshot, you capture a precise moment in time. That's not always desirable—at least, not when it comes to the status bar that sits atop the screen. Oh, that pesky status bar, glibly letting everyone know you snapped the screenshot well after midnight, your battery dangerously low, your signal strength weak. Such elements can distract from your screenshot, and thus have no place there. Status Magic offers two slick ways to improve matters. 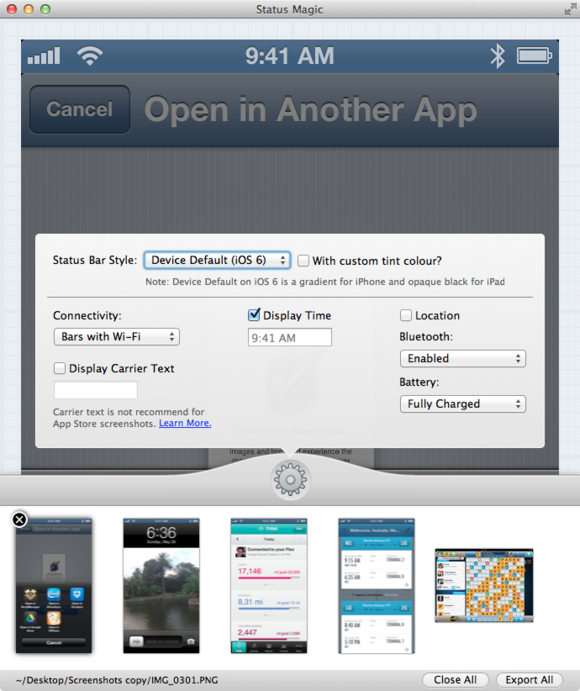 First, you'll drag your screenshots onto the app's Dock icon, or open them from the File menu. (Oddly, you can't drag screenshots onto Status Magic's window.) Then, click the app's gear icon to customize precisely what you want Status Magic to do. You can either have the app superimpose a status bar of your choosing, or have it remove the status bar entirely. And when I say you can customize the status bar, boy can you: Tweak its color and transparency, choose what kind of signal strength it shows, adjust what carrier text (e.g., AT&T or Verizon) gets displayed, change the time, tweak the battery indicator, and toggle the Location and Bluetooth status indicators. When you're content, you can export one screenshot or all of them, and your work is done. Status Magic works fast, cleans up iOS screenshots, and offers just the right options. If you take iOS screenshots, Status Magic makes them look better.